Various forms of Tai Chi Chuan are practised all over the world, mostly for it's medicinal value. However, most people do not realise that it originated as a self defence system and has great value in Martial Arts. 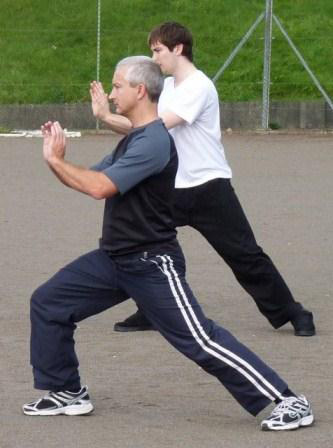 We practise two forms, Yang and Chen (named after the families that created them), as well as the two person discipline of Push Hands and the Two Person Tai Chi Set (See Below). Push Hands in itself has a variety of practices, from simple set pieces to actual sparring. It is very useful for practising close quarter engagements and the use of elbows, knees, locks and throws. Both forms are very fluid, the movements flow from one to the other without stopping. However, Chen style Tai Chi is performed much faster than the Yang, and has many powerful and dynamic movements.